I watch way too much TV when I'm working out, especially reality TV like Survivor, The Biggest Loser, The Real World and its spin-offs. And when I'm not working out, I'm guilty-pleasure reading my celebrity news at people.com or scanning bios of contestants on their appropriate sites in hopes of finding a sporty twist. How does fit into fitness? I love it when my celebrity sites provide info with an active spin, and lately I've been lucky with more findings, especially those with a bike focus. And with National Bike Month underway it seemed all-to-appropriate to celebrate the bike. Caught in the act? These celebrities have appeared occasionally sporting two wheels on the Star Tracks pages of People magazine or people.com. Matthew McConaughey--I've seen him running more than biking but I swear it's happened at least once. Plus he was a competitor in last year's Malibu Triathlon so we know he took to the bike for that. Mary Kate Olsen and Miley Cyrus--I was trying to aim for some female power to the list, but these were the only two recently two-wheeling across town. Not road biking, but hey, at least they were pedaling. Reality shows have been seeing their fair share of cyclists these days. It started with Tyson on Survivor: Tocantins--or at least he was the first I noticed--a former professional cyclist trying to make a go at the million-dollar prize. Until he was blindsided at tribal council a few weeks ago, he was dominating the immunity challenges and looking to be a force to reckon with at camp. 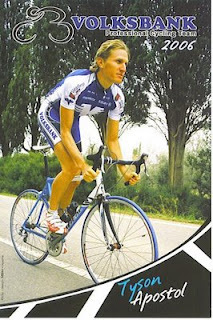 I wonder if the six years he spent as a pro cyclist in Switzerland, Austria and Belgium have anything to do with it. Then when The Duel 2 premiered on MTV with past Real World and Road Rules cast members, it brought back Landon Lueck, a Real Worlder from the Philadelphia cast, who now dabbles in mountain biking and Xterra races. When he's not working landscape design, he's tearing up the singletrack first as an amateur and now as a team member with Mafia Racing. He also had a stint working at the Trek store in Madison, Wis., and as a wakeboarder with the University of Wisconsin club team. Now the latest news is that the next season of The Bachelorette will have an Olympic cyclist among the bachelors up for grabs. Hmm, I probably could search for single Olympians to figure out who it might be, but I'll wait until the cast is introduced. At the moment I'm more curious about how he'll mesh with the rest of the men and what other types we might see--and wonder if the athlete stands a chance after the last season where snowboarder Jesse Csincsak was selected by Deanna Pappas and then dumped before the nuptials.